The new Morrisons Free From range hit my store recently and I just couldn't wait to try the curly fries as soon as I got them home! 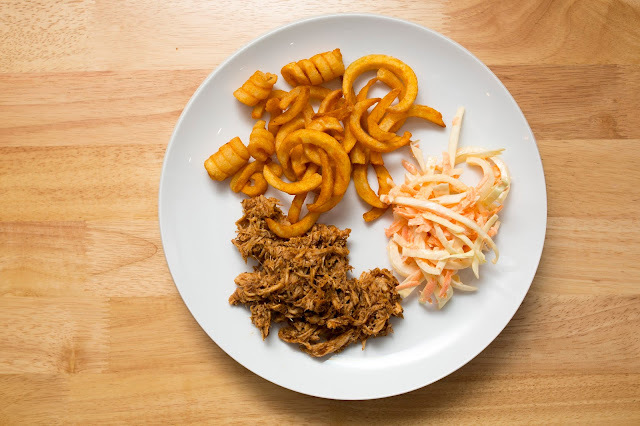 I decided to have an American themed evening with Pulled BBQ chicken, homemade coleslaw and curly fries. In terms of the pulled chicken, all I do is pop two chicken breasts in the slow cooker for 5 hours on low. I then shred the chicken and pop it back in the slow cooker with the BBQ sauce before mixing it together and heating it for another half hour on low. The coleslaw is just as simple. Grate two medium carrots and shred a couple of white cabbage leaves and a small onion, place in a bowl and mix with two heaped tablespoons of mayonnaise, a teaspoon of mustard and a slash of lemon juice. I then added the curly fries to the dish, and it was complete! The fries are seasoned well but are not overwhelming, they crisp well when baked in the oven and taste exactly how I remember curly fries, just without the gluten! For only £1 for 600g I thought this was also very reasonable for a gluten free labeled product. A portion of 125g contains 315 calories so these are certainly a treat! But I was surprised how many fries you actually got for 125g. It was a good sized portion and more than I would normally cook for myself. I would certainly buy these again and I think they are perfect for children too as the seasoning isn't too strong for younger tastebuds, making them great for not only dinners but parties and hot buffets too! At this low price point, you can feed these to the whole family or party without breaking the bank either! And nobody feels left out. I would love to know if you have tried any of the Free From range in Morrisons and what you have thought about it!